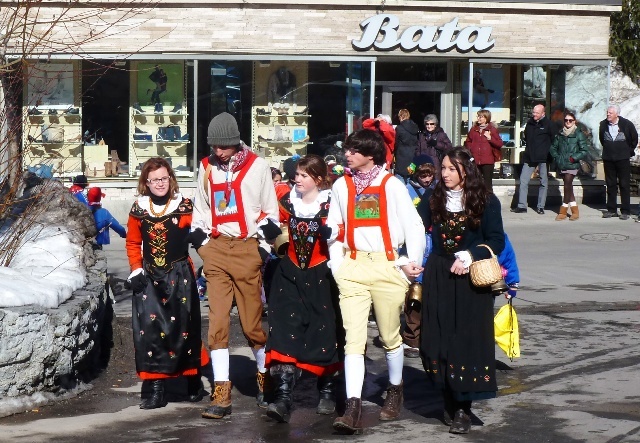 The sound of children’s laughter ricochets along the road as round the corner comes a long processions of tiny tots, youngsters and teenagers, brightly dressed in colourful traditional Swiss costumes. 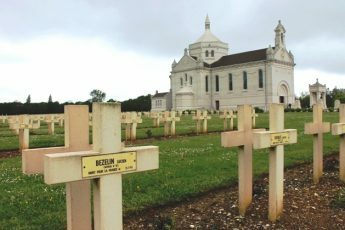 They pass by arm-in-arm, wearing their outfits with pride, delight and some looking slightly sheepish. The sun shines over the chic town of St Moritz, melting the snow and bringing a cheery glow to the proceedings. 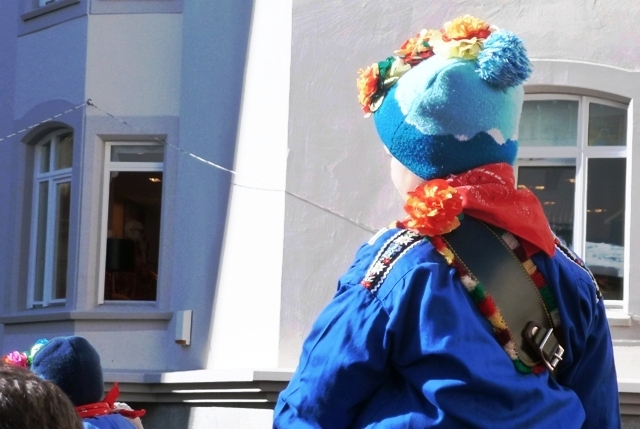 It’s March 1st and the ‘Chalandamarz’ festival is in full swing. Behind them a sleek figure heads off towards the famous Cresta Run and Olympic Bob Run on the edge of town. ‘Cresta Rider’ by David Wynne is a life-size bronze sculpture of a skeleton rider. 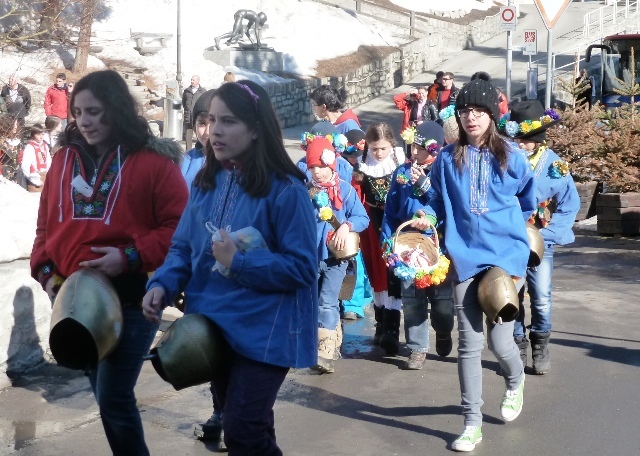 It was a gift to from St. Moritz Tobogganing Club to the municipality on the club’s centenary celebrations in 1985. 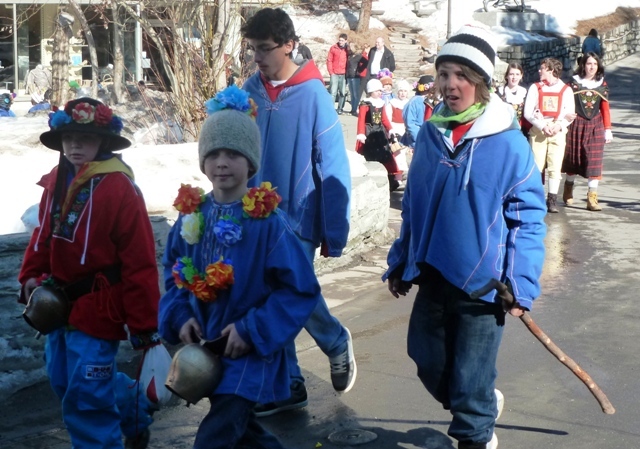 Chalandamarz is an alpine Swiss tradition to banish winter and is the largest children’s festival in the region. 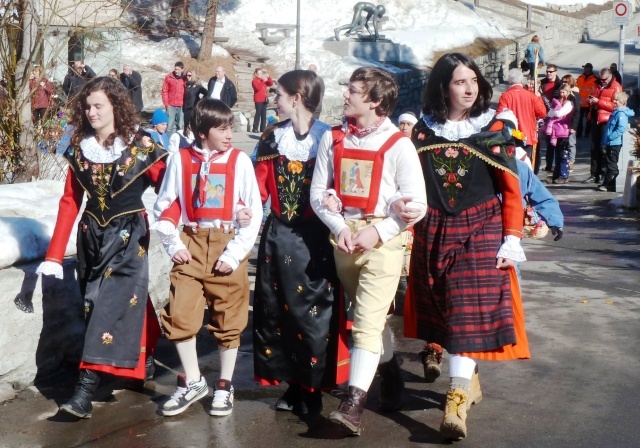 It’s celebrated in the Engadine Valley and other areas including val Mustair, Oberhalbstein and Bregaglia. Many of the boys and some of the girls carry big bells which they ring with great enthusiasm, to encourage the grass to grow better. Red and blue predominate, with flower-bedecked hats, embroidered dresses and jackets and an eclectic mix of footwear adding to the rainbow effect of the procession. The older boys wear red braces and lederhosen. Parents, family, friends, locals and tourists clap as they pass, taking photos and cheering them on. The Chalandamarz procession winds down the hill into St Moritz town centre, where hundreds of people are waiting to see them arrive. Some stand on chairs to get a better view. This is Switzerland and there is a mood of good-natured polite anticipation all around. 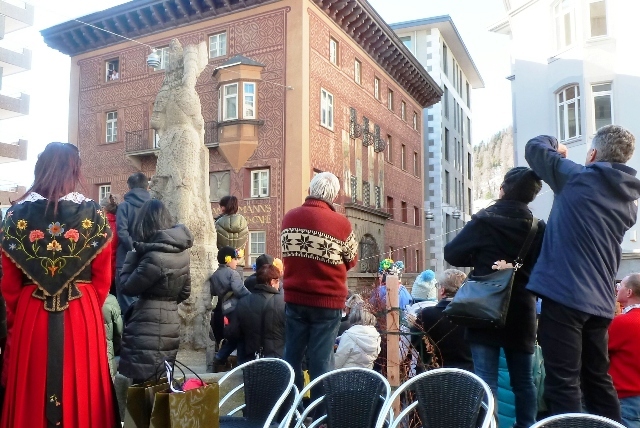 As the children enter the square, there’s a burst of applause and everyone starts singing a song; maybe something to welcome the spring and end of winter’s grip. Little ones are popped up on shoulders to get a better view. Once the procession has passed through, everyone starts to disperse. St Moritz streets are crowded with happy people in beautiful clothes, making a charming juxtaposition with the traditional architecture and uber-fashionable shops, hotels and bars. It was so lovely to see so many children enjoying themselves and also the lovely costumes. The festival gave another view of St Moritz, which does have a lot of designer shops and very smart hotels. 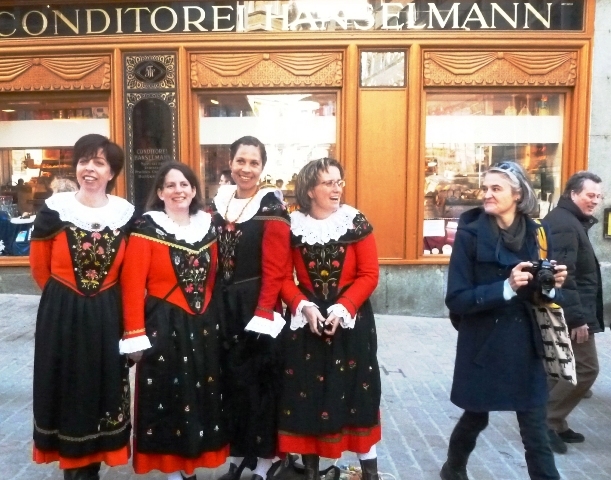 Interesting read – Switzerland is the home of quirky traditions! The children look gorgeous.